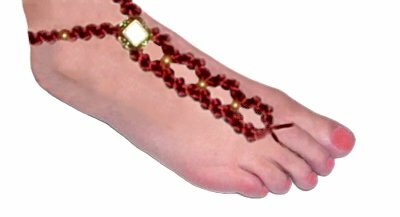 Description: These Easy Barefoot Sandals feature only two very simple decorative knots. Oval shaped designs rest on the front of the foot, and the ankle straps are knotted. 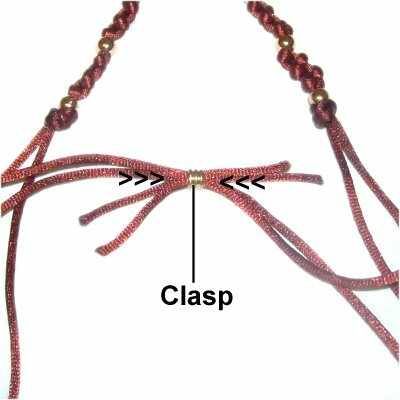 The closure at the back of the ankle is a simple bead clasp. This Macrame pattern is designed in such a way that you will need to use beads. They should have holes large enough for two cords to pass through EASILY, especially if you are using Satin cord. A focal bead or button can be added to the area near the straps. Foot Jewelry needs to be comfortable. For that reason, I recommend you use Satin cord to make this design. It's luxurious and very soft, but is also delicate, so do not push pins through the material. Use the Cross Pin Technique, or LEAN the pins over the cords, to secure them. 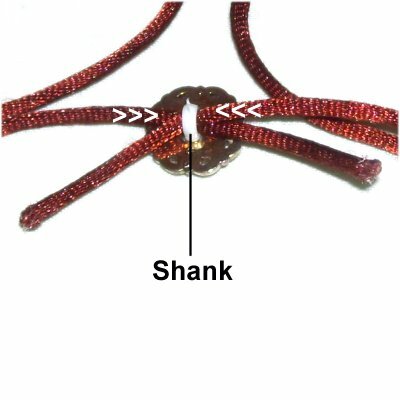 Preparation: The first step to making these Easy Barefoot Sandals is to measure your foot. There are three areas to focus on: The area where the toe loop will wrap around, the oval design on the top of the foot, and the ankle straps. When the measurements are done, add all three numbers to get the total length. 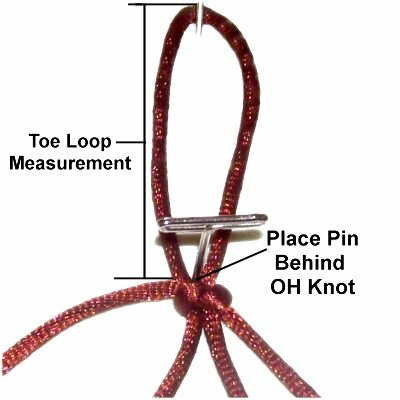 Toe Loop: Measure around the second toe, then add 1-inch, so the knots start just beyond the toe. Oval Design: Measure from the crease near the toe to the place where you want the straps to branch off. Ankle Straps: Measure from the branch point to the back of the ankle, in both directions. Step 1: Cut two cords, at least 8 times the total length you need for your Easy Barefoot Sandals. Prepare the tips of the cords to prevent unraveling. 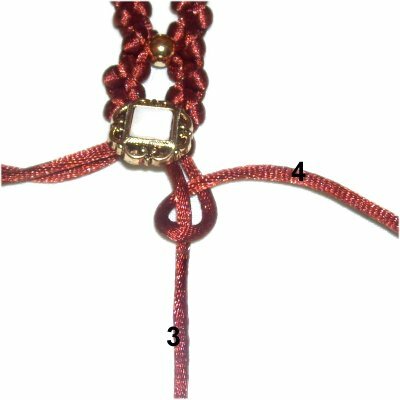 Satin Cord (nylon) can be prepared by applying a flame to the tips. Fold cord 1 in half and secure it vertically on your board. The Cross-Pin technique was used in the example shown. Fold cord 2 and place it under the first. Secure it at the fold, by leaning the pin backward over the material. 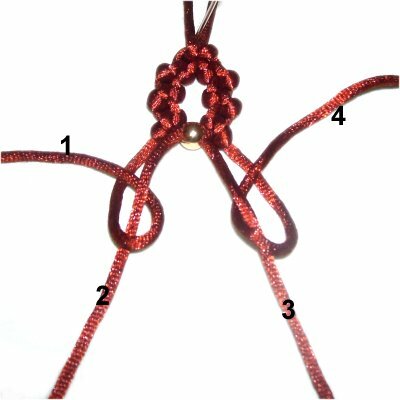 Use cord 2 to tie an Overhand knot, placing it in front (over) cord 1. Measure cord 1 from the fold down to the Overhand knot. 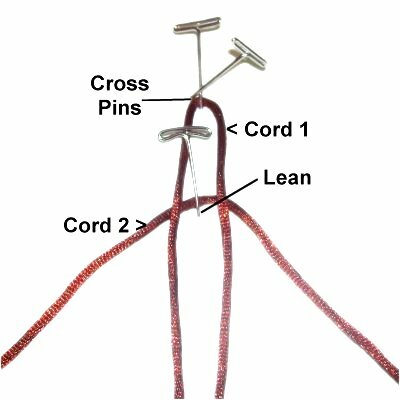 Move the knot up or down, until the toe loop measurement is reached. Place a pin behind the Overhand knot, so it cannot slide backward and change the size of the loop. Step 2: Mentally number the four cords. 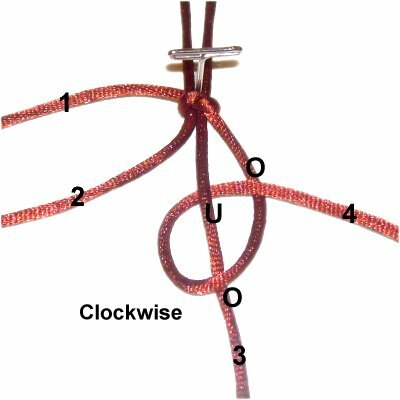 Use cord 4 to tie a Half Hitch, by making a clockwise loop over - under cord 3. As you pull it right, pass over cord 4. 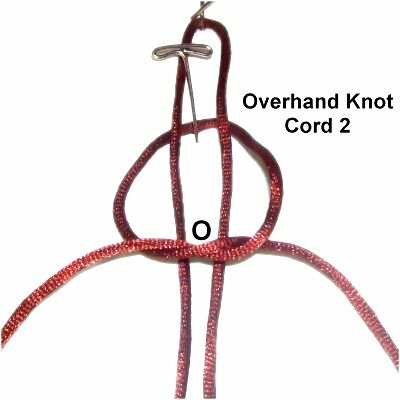 Use cord 3 to tie the next Half Hitch onto cord 4. It's tied the same, only the loop is counter-clockwise. Step 2, continued: Alternate back and forth between cords 3 and 4 to tie four more Half Hitches, for a total of six. Tighten each knot with one hand, while holding the sennit firmly on the board. 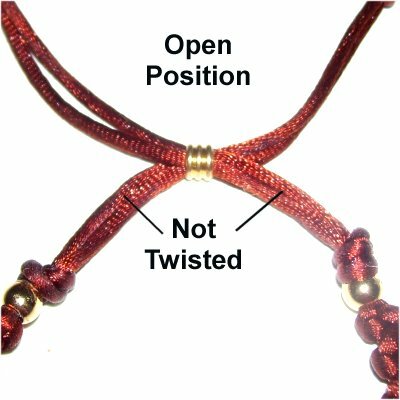 This will help prevent twisting. Step 3: Repeat step 2 using cords 1 and 2. 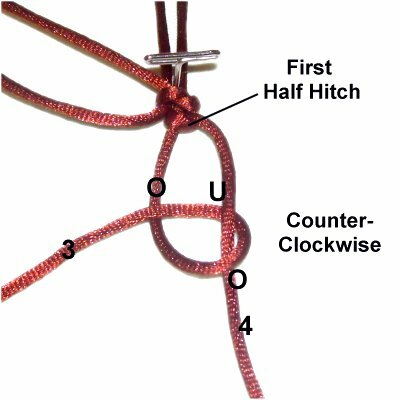 The first Half Hitch should be tied with cord 1 onto cord 2. Tie a total of six Half Hitches. Step 4: Arrange the bead so the hole is horizontal. Pass cord 2 through it from left to right. Pass cord 3 through from right to left. Pull both cords to slide the bead up to rest between the two Half Hitch sennits. Step 5: Repeat steps 2 - 4 at least two more times. 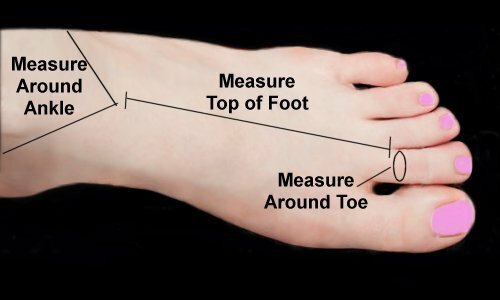 Measure this area of the Easy Barefoot Sandals as you progress, and stop when you reach the Oval Design measurement. Try it on to see how it fits. Make adjustments as needed. You can add a different type of bead (focal bead) or button after the oval shapes are done and you are ready for the straps. When using a button, pass cords 2 and 3 through the shank in opposite directions, like you did the beads. Step 6: To make the right strap, tie 6 - 8 Half Hitches with cords 3 and 4, as you did in step 2. Step 7: Slide cords 3 and 4 through the hole in a bead, but this time vertically and in the same direction. Step 8: Repeat steps 6 and 7 several times, until the length of the sennit is the ankle strap measurement. Step 9: Repeat steps 6 - 8, using cords 1 and 2. 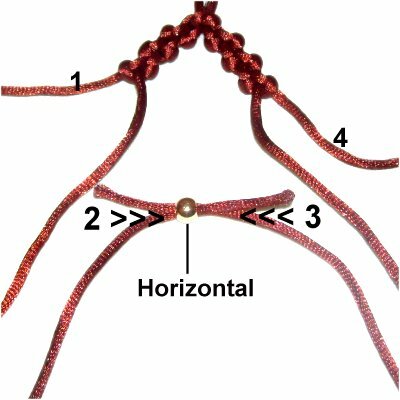 The first Half Hitch for each group of knots should be tied with cord 1 onto cord 2. Add a bead to each strap before moving on. Step 10: Tie an Overhand Knot with cords 3 - 4 as shown. Tighten the knot so it rests against the bead you added in the last step. Do the same with cords 1 - 2. 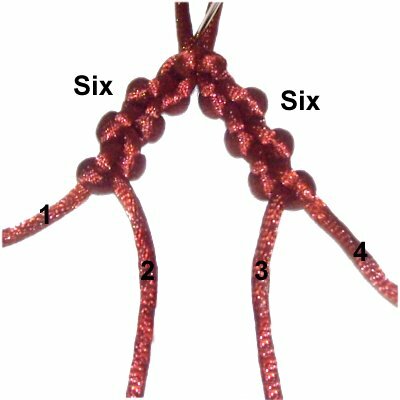 Step 10: Start the bead clasp for your Easy Barefoot Sandals by passing cords 1 - 2 through the bead from left to right. Cords 3 - 4 go through it right to left. Test the clasp by pulling the ends. The bead should grip the cords, but they should still be able to slide through easily. Important: Make sure the cords are not twisted around each other as you pass them through the bead. Checking this in the open position is easier. Step 11: Put on the Easy Barefoot Sandal to see how it fits (or measure it). Pull the ends to close the straps around your ankles. 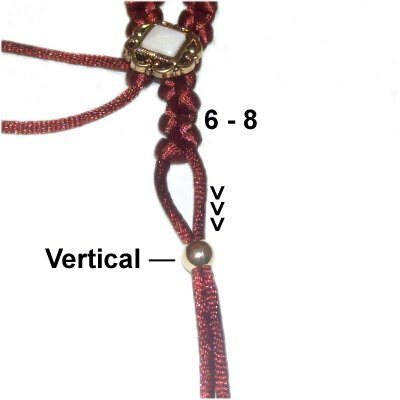 You can still remove the clasp, and untie the Overhand knots, to adjust the size of the straps to fit your foot. Add or remove Half Hitches as needed. Once the size is correct, remove it from your foot. Pull the ends so the clasp is in the closed position (bead rests against Overhand knots in strap). 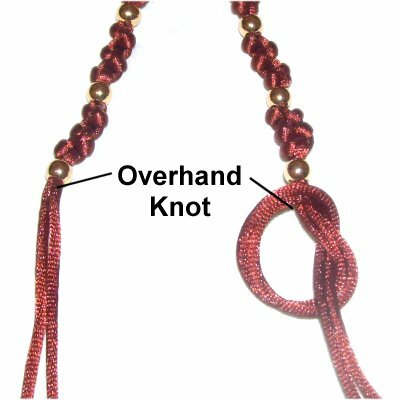 Step 12: Move down at least 3 inches from the bead clasp, and tie an Overhand knot with cords 3 - 4, as you did in step 10. Do the same with cords 1 - 2. You can add a tiny amount of glue inside these knots if you wish, but keep in mind that glue will often darken Satin cord permanently. Important: Before cutting off the excess material, measure the Easy Barefoot Sandal (or try it on) one more time. After you cut off the excess, you can apply a flame to the tips if using NYLON Satin Cord. By melting the material, it's less likely that the knot will untie. Step 13: Repeat steps 1 - 12 to make the second sandal. Have any comments about the Easy Barefoot Sandals? Contact Me.